Lent is coming next week. We're running out of time to prepare. 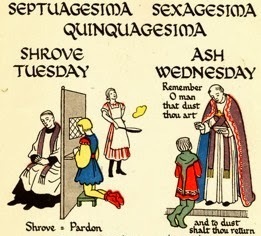 In the past, you could find a traditional Lenten Mission at many parishes. Now, unless you are near a traditional parish, they are nearly extinct -- or worthless. Fortunately, we are not meant to live in the past, we are meant to live in the now. And, now, we have the Internet. And there is an abundance of good on the Internet, along with the bad. As we do every year, we bring to your attention this wonderful, traditional, five-part Lenten Mission by the holy and learned Fr. Isaac Mary Relyea. While it is not short, it does go by very quickly, and is easy to follow and understand. It's clear, concise and bold. As the season nears, you would do well to listen to this, to pray on it and to use it to prepare for a fruitful Lent -- and be ready for it to change you for the better. Please consider helping Fr. Isaac. If these sermons end up meaning as much to you as they do to us, please consider giving whatever you can to cover Father's expenses. To donate, please send your contribution to the address below. You can reference Rorate when you write. No donation is considered too small.